The Diamond Way Buddhism UK Blog would like to wish all our readers a very happy Christmas and a prosperous New Year. 2010 was the first year of the blog (although we added some posts retrospectively for 2009). Over 2010 it has become very popular, now with over 450 subscribers. During the year the blog was viewed over 19,000 individuals in over 90 different countries, with most viewers coming from the UK, the USA, Poland and Germany. Many also viewed the blog’s events timeline which has been regularly updated as new events were held. May 2011 bring you all much joy and development! This entry was posted on Saturday, December 25th, 2010 at 11:20 am and is filed under Diamond Way Buddhism. You can follow any responses to this entry through the RSS 2.0 feed. You can leave a response, or trackback from your own site. Thank you for the good wishes and mostly for the great job you are doing. I am a huge fan and appreciate all the information you share with us. I also confess on spying many articles and translating them for our Diamond Way group page in Spanish (El Salvador). Do continue the great work!! thank you for the good wishes and i will continue with Mar’s sentiment of immense gratitude for the wonderful work you are doing. i enjoy all the posts. i am a student of Shamar Rinpoché and very grateful for Lama Ole and the DW centers activities of spreading the dharma in the ten directions! an ocean of wishes for the coming year! may all your activities continuously lead beings to recognize their natural face! alalaho! p.s. 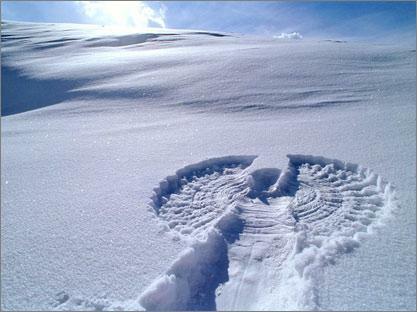 i love the picture..it is usually known as a “snow angel”…but i instantly recognized it as Thousand-armed Chenrezig!